IT'S NO secret that 8-ball and straight pool are similar games. Unlike rotation games, where you have to go from one ball to another, you must devise a plan for multiple balls in multiple pockets. What many 8-ball players overlook, though, is how much you can learn from practicing straight pool every now and then. Straight pool teaches you short position play, putting a premium on controlling of the cue ball. 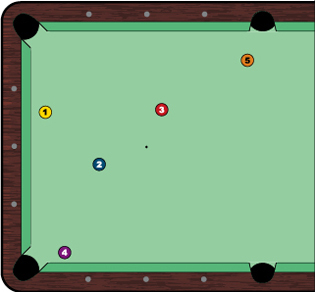 Unlike 9-ball, where you can often let your stroke out and rely on generalities when it comes to position, straight pool will force you to identify the exact spot you want to leave the cue ball. By practicing such short position play, you will greatly improve your ability to run balls. If you have to play precise position, you will immediately see improvement in your 8-ball game, where you'll have to maneuver the cue ball in tight spots. Practicing straight pool also will improve your ability to see patterns. With 15 balls that can go in any of six pockets, you'll have multiple solutions to the same layout. With a little trial and error, you'll begin to see what works for you and what doesn't. When you start practicing straight pool, don't overwhelm yourself. If you think you can plan five balls ahead, begin with five balls on the table. If you can only think three balls ahead, use three balls. Don't feel like you have to start with a 15-ball rack. When you spread an appropriate number of balls on the table, look at the layout and ask yourself, "What's the best way to set yourself up for a break shot?" You can work backward, which is just like working backward from the 8 if you're playing 8-ball. Pick out the ball that will give you a chance to break the next rack. Now, figure out which ball will let you get an angle on your break shot. In Diagram 1, the 3 ball (into the upper left corner) is a perfect ball for your break shot. Knowing this, you can identify the key ball (the ball that puts you in position for your break shot). Here, the 5 ball in the top side pocket is one option to give you a perfect angle on the 3. If you can pocket the 1, 2 and 4 balls while getting in position for the 5, you are on your way to using straight pool to improve your skills in 8-ball.